Ross, Clifford E., son, age 3, born in Idaho. CAMBRIDGE--Services for Raymond Edwin Ross, 78, Cambridge, who was killed in an automobile accident December 16, 1981, in Cambridge, will be conducted at 2 p.m. Saturday in the Cambridge Baptist Church by The Rev. Larm Carr, under the direction of Thomason's Northam Jones Funeral Home, Weiser. Interment will follow in Cambridge Cemetery. He was born October 30, 1903, in Hebron, Iowa, to William Edward and Cora May Lindsay Ross. At age 9, he moved with his family to the Boise Valley where he was educated. He married Alena Hinshaw on September 9, 1934, in Boise. They moved to Cambridge, where they ranched until 1951. He worked for the Oregon Portland Cement Company in Lime, Oregon from 1961 until retiring in 1968. He was caretaker for the Cambridge and Salubria cemeteries. He was a member of the AFL-CIO and the Baptist Church. Survivors include his wife of Cambridge; a son; three daughters; five grandchildren and numerous cousins. He was preceded in death by a brother. Memorials may be made in his name to the Cambridge Ambulance Fund. Alena (Hinshaw) Ross, 81, Cambridge went to her eternal rest on Monday, May 19, 1997, at a Weiser care center. Funeral services will be held at 2 p.m., Saturday, May 24, 1997, at the Cambridge Baptist Church. Burial follow at the Cambridge Cemetery under the direction of Thomason Funeral Home, Weiser. Alena was born October 11, 1915, at the family home on Rush Creek near Cambridge, Idaho, the daughter of Andrew Milton and Mary Eugenia Favre Hinshaw. She attended grade school at the Rush Creek School and high school in Cambridge. 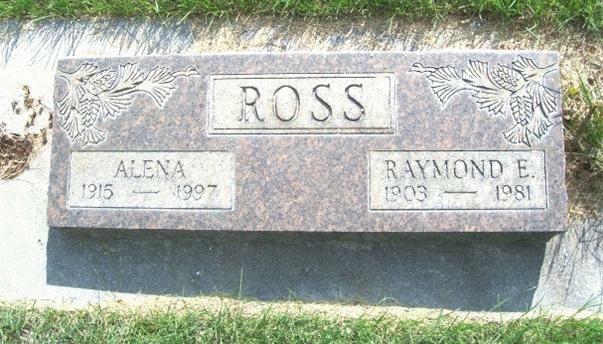 Alena married Raymond C. Ross September 9, 1934, in Boise, Idaho. She belonged to various Cambridge clubs and organizations and was always available to help neighbors and friends. Alena enjoyed gardening, berry picking and especially fishing. Survivors include a son and his wife; three daughters; six grandchildren; six great-grandchildren; three sisters and a brother. She was preceded in death by her husband, Raymond; and an older brother, Cletus Hinshaw. The family suggests memorials be made to the Cambridge Ambulance Fund, Box 187, Cambridge, Idaho, 83610. Contribution from Alvena (Ross) Kinkade. 1940 census, Cambridge, Washington County, Idaho; roll T627-755, ED 44-15, page 8A, line #21, household #167. Idaho, Marriage Index, 1842-1964, 1975-1996; http://www.ancestry.com.